Tour operator Thomas Cook says its earnings are still being impacted by recent terror attacks. The holiday giant reveals that sales were hit hard in Germany and across Continental Europe over the summer, tumbling by 9%. It said bookings are also "significantly down" in Belgium after the terrorist attacks at Brussels airport in March. But stripping out the impact of sharply lower demand for trips to previously popular destination Turkey, the company says bookings surged by 13% over the summer in the UK and were 8% higher overall. Chief executive Peter Fankhauser insists travellers still want to holiday overseas, but are switching to destinations such as the Balearic and Canary Islands and the United States, alongside smaller destinations like Bulgaria and Cuba. The travel industry has been knocked hard by a string of terrorist attacks in Turkey, Belgium, and Paris and Nice in France, while the Brexit vote and plunging pound are also taking a toll. Mr Fankhauser said: "Customers' desire to go abroad on holiday has remained strong, with the exception of Turkey where demand continues to be volatile." Thomas Cook cut its annual earnings outlook in July, warning of the impact of the terrorist incidents. The owner of UK airline Monarch revealed on Monday that it is in talks over a potential takeover of the carrier and is preparing to throw it a multimillion-pound lifeline. This comes after Low Cost Holidays collapsed earlier this year, affecting more than 140,000 customers. 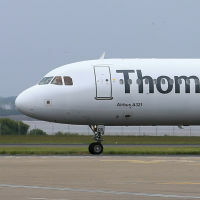 In its latest update, Thomas Cook says prices of UK summer bookings are 5% lower for the summer period, with the operator selling more "seat-only" flight deals alongside its package holidays. The group says summer bookings dropped 6% in Germany, although it said it fared better than the wider weak tour operator market. Holiday bookings over the winter season are following a similar pattern, with strong demand from the UK being offset by a weaker performance across Europe. The group says its winter season is only 27% sold so far, in line with the previous year, with UK bookings up 8% and ongoing weak demand in Germany and Belgium. Tourists visiting any destination should take out travel insurance.